HomeResourcesAre All Job Interviews Useless? Are All Job Interviews Useless? When you line up and go through job interviews, are you wasting your time? This is not an easy question for most of us to answer, although you might have an opinion based on your experience as a candidate (good or bad). Recently I came across an article indicating that companies themselves tend to place more emphasis on the value of in-person interviews than on objective assessment, even though it’s often not justified by the performance of those they hire. The article, titled “Job Interviews Are Useless,” maintained that companies fool themselves into thinking an in-person evaluation of potential new hires helps them get a better sense of who the best candidates are than objective evaluation does. Mind you, the article is written from an employer standpoint, not from a job seeker’s perspective. For one thing, you probably already know that not all interviewers are equally skilled (some aren’t skilled at all) or well-trained in conducting interviews. 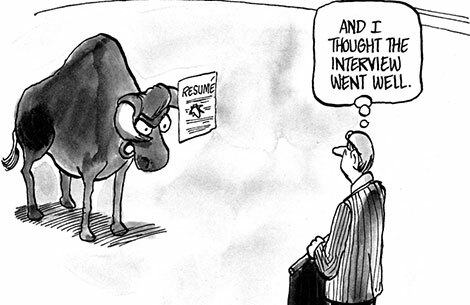 Of course, you can and should prepare thoroughly for all your interviews. At the same time, you should be aware that if you get stuck with a relatively unskilled interviewer, you might need to take a more active (albeit subtle) role in guiding the interview, if you expect to accomplish anything worthwhile from it. Employers are naturally looking at the situation from a different angle–theirs. Sometimes (maybe often, according to the article) that can make them reluctant to modify or abandon an approach that apparently doesn’t work as well in practice as it does in theory. Get Rid of Job Interviews? Seriously? Probably not going to happen! But does this idea (and in fact the whole article) provide any clues to the attitude you should take toward pursuing and participating in interviews? One way that’s potentially very effective in terms of your job search planning and ultimate success involves postponing the interview phase until you’ve networked your way into being considered for opportunities–especially those that haven’t yet been published to the world at large. When you’ve established connections and relationships that give you an early crack at opportunities and get the right people interested in you, job interviews could actually be valuable. Why? Because you’ll be talking with people who have the ability and authority to make hiring decisions–such as the manager you would be working for if hired. Assuming you’ve done your homework and put the right amount and kind of effort into it, you can then work on making the interviews productive and ensuring that you’re viewed as a top contender. If you handle this well, you can surmount the obstacle of interviews that go nowhere because they’re poorly planned or have other flaws the company hasn’t seen or acknowledged–and potentially capture a great job offer in the process.